If you are a book reviewer for a newsletter, journal, website or a non-profit organization, please contact us to receive a complimentary review copy of Life Skills. "Life Skills offers a new and simple way to look at old situations and make life better for yourself and those around you." "...beyond just an excellent reference book Metapsychological philosophies and techniques and brings these methodologies into the realm of self-help for all individuals wanting to improve the quality of their life." “This is the first time I read about Applied Metapsychology in clinical practice. I am lucky to have come across a concise, eminently-readable, empathic, joy-filled, hands-on text." "If you take the trouble to do the exercises the way the author suggests, they will change your life." --Robert Rich, M.Sc., Ph.D., M.A.P.S., A.A.S.H. "Marian Volkman's ultimate objective is to help each reader to achieve maximum fulfillment of human potentialities..."
"I recommend this book to anyone who's setting out on their personal life's journey and adventure. I rate Ms. Volkman's book 5 stars!" There are books for reading and then there are books for studying. This is one of the latter, and is worth studying by everyone who would like to live more happily. It offers insights into the relatively new science of Metapsychology developed by Frank A. Gerbode M.D., an American psychiatrist whose university qualifications are sufficient to share around three or four eminent experts with a few to spare. He found a way to simplify the world view to its most basic, person centred form and developed this into metapsychology. Marian Volkman has been studying the subject for many years and was among those assisting Gerbode in the creation of the technique of Traumatic Incident Reduction. Life Skills offers a new and simple way to look at old situations and make life better for yourself and those around you. Be warned, this book will probably affect the way you view everything and everyone around you. People who annoyed you previously will become more comprehensible, stressful situations will be less so and wise decisions will be easier to make. Most terrifying of all - you will be more likeable as you begin to like yourself more. There is a section on a kind of psychological first aid that I found particularly intriguing. The system is so simple a child could use it and the author cites cases where a children have. In one, a three year old fell and banged her head. Predictably she began to scream loudly, bringing family members hurrying to her aid. The first to arrive was her four year old brother who used a technique called “Then and Now” in which a series of simple questions are asked repeatedly: what happened; where were you then; where are you now: until his sister calmed down, when he asked how she was. This took only a few seconds, after which she was happy to go off and play. As luck would have it, my little granddaughter had a similar accident the following day and I had the opportunity to test the technique. It worked wonderfully and just as quickly. No lingering sobs, no clinginess after the initial “make it better” cuddle. Just a happy little girl ready to play. In another chapter, the emotions are explained by way of a scale standard amongst psychologists, where the lowest point “0” is apathy and the highest elation with anger and contentment somewhere in the middle, but in Life Skills, the author goes on to suggest a mirrored scale running beneath “0” in the same order to suggest reasons for criminal tendencies, something that the usual scale does not. There is so much in this relatively slender book that one wonders how Marian Volkman squeezed it all in and it definitely merits careful reading. Marian Volkman has created an excellent tool for inner growth. She presents simple, practical, and extremely useful skills one can use to improve one's self, relationships, and environment around them. Highly recommended. On a daily basis I utilize an excellent concept I picked up from this book: I am able to embrace and appreciate the beauty in objects, people, and things around me without having to make them my possessions. This one concept has provided a great deal of serenity and peace. Just this one practical tool has changed my life. Practice all the exercises and reap the benefits that are in store for you. Life Skills: Improve the Quality of Your Life with Metapsychology is a book in the Explorations in Metapsychology Series edited by Robert Rich, PhD. The books in this series focus on the healing of the mind and the spirit using Metapsychological philosophies and methodologies. Several of these books have looked at the philosophy and therapies associated with Traumatic Incident Reduction (TIR). These methodologies are particularly useful for individuals suffering from the aftermath of traumatic experiences and Post-Traumatic Stress Disorders. Though good research resources for individuals suffering from such afflictions, the information within these books focuses on educating therapists about such philosophies and techniques. Life Skills also aims to focus on healing the mind and the spirit. Though this book has a chapter on TIR, this book looks at a wider range of subjects to improve quality of life. These subjects include topics such as the definition and realities of quality of life; the predicting and understanding of emotional levels; relationships; the idea of success; understanding the negative aspects of human behaviour; and becoming more aware of yourself and the world around you. Likewise, though this book will serve as a good resource for therapists, the general public will also find this book helpful. Topics are discussed in everyday language and explained without jargon or hidden superior attitudes. Furthermore, readers will find that the exercises that accompany each section of this book will not only help further solidify the concepts explained but will also allow the reader to tailor his or her new findings to his or her life and particular situation. This aspect makes takes this book beyond just an excellent reference book Metapsychological philosophies and techniques and brings these methodologies into the realm of self-help for all individuals wanting to improve the quality of their life. Robert Rich, M.Sc., Ph.D., M.A.P.S., A.A.S.H. Frankly, I had certain apprehensions as I began to read this book because I did not understand terms such as Applied Metapsychology and Traumatic Incident Reduction. I soon realized, however, that Volkman wrote this book for therapists and practitioners of all kinds [and] their clients but also for others such as I who wish to use the tools which she provide, either individually or in a group. In layman¹s terms, Applied Metapsychology unifies mental and physical experience. Its purpose is to discover rules that apply to both. As for Traumatic Incident Reduction (TIR), it involves a brief, one-on-one, non-hypnotic, person-centered, simple and highly structured method for permanently eliminating the negative effects of past traumas. TIR is thus part of the larger subject of Metapsychology. Volkman¹s primary objective in this volume is, as the subtitle suggests, to help improve the quality of her reader¹s life in all of its dimensions (mental, physical, emotional) by explaining various ³Life Skills² which anyone can acquire and then strengthen. Volkman¹s ultimate objective is to help each reader to achieve maximum fulfillment of human potentialities, whatever the nature and extent of those potentialities may be. More specifically, she helps her reader to become fully present in all experiences, to increase knowledge and awareness of how life works, to bring about positive mental and emotional change and then to enable those personal changes to assist positive changes in the outer environment, and finally, to help each reader access more of her or his potentialities through a series of eminently practice exercises. Volkman hastens to add, however, ³We all process information in our own ways. The exercises are suggestions only. I invite you to read and use this book in whatever way suits you best. Many years ago, Justice Oliver Wendell Holmes¹s observed "I wouldn't give a fig for the simplicity this side of complexity but I'd give my life for the simplicity on the far side of complexity." To Volkman¹s great credit, she helps readers such as I to understand certain terms and techniques which would otherwise be difficult (if not impossible) to grasp, much less apply. Presumably she would agree with me that it would be a serious mistake to proceed from one exercise to the next, completing each without careful consideration. My suggestion is to read her book from beginning to end to gain a sense of what it offers, then re-read those portions which resonate with one's own specific needs, interests, fears, concerns, and (yes) hopes. Only afterward should some (but not necessarily all) exercises be completed and in whatever sequence seems most appropriate. Any process of self-discovery is necessarily a rigorous, difficult, and sometimes a frustrating and lonely journey. Volkman cannot accompany anyone during that journey but she can indeed help to guide and inform those who embark on it. The voyage of life is on everyone's minds. How you handle it is something only you, the Captain of your fate, can determine and eventually carry out - whether it's good, bad, or indifferent. The choice and responhsibility of that everlasting tour of life depends on a great many things. 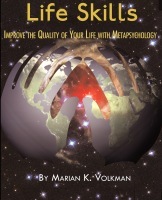 In Life Skills: Improve the Quality of Your Life with Metapsychology , by Marian K. Volkman, she provides you with a master blueprint. It's up to the individual to pick and choose, and then follow their heart's desire, passion, or resolution. It's also up to that person to turn back if one's road ahead becomes blocked, overgrown or denied continuance. I just wanted to drop you a line to say how much I really, really enjoyed your book - 'Life Skills'. My lovely mum passed it to me a couple of weeks ago, and I found myself reading it cover to cover, whilst working away in Sheffield! It was so lovely to read something so clear, accessible and life enforcing! I found myself dipping into it regularly after a hard days rehearsal, and always feeling lifted and refreshed by your "little gems of clarity and wisdom"!